from about 5% to 20%. This means that power prices stay closer to a mix of coal, gas and emission prices. 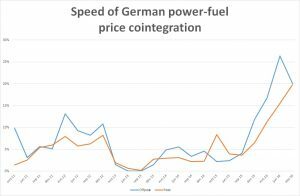 Why are power and fuel prices cointegrated? To understand how the price of energy is made up, it is important to realize that fossil fuels are still the main source for power production. A merit order helps to visualize this mechanism. First non-dispatchable sources, primarily solar, wind and most of nuclear fulfill demand. However, the production of these sources is often not enough to meet requirements. We need more electricity – produced at gradually higher marginal production costs. Many countries have organized this second part as follows: first the energy comes from efficient coal plants. Then from less efficient coal plants or more efficient gas plants. And finally from less efficient gas and oil plants (peaking stations). Fuel-fired producers therefore heavily influence the price of energy. KYOS uses cointegration in all of its models for generating Monte Carlo price simulations. It ensures that commodity prices and commodity spread scenarios are realistic. In particular, it avoids that spreads become extremely wide or narrow, if that is not in line with market fundamentals. This is especially relevant for conventional power plants (KyPlant), whose margins are derived from the spread between power, fuel and emission prices. The use of cointegration in statistical models is very relevant for valuation and risk management. The planning horizon is medium term, or up to two years. It captures how market prices actually move, in terms of return volatilities, return correlations and price cointegration. With the observed levels of cointegration, spark and dark spreads are considerably less volatile. If we ignore this behavior in power prices, it will lead to an overvaluation of power plants and spark/dark spread options. Over longer horizons, it is even more important to carefully treat the statistical parameter estimates. A fundamental analysis may be more appropriate for long-term investment decisions. Fundamental analysis, however, is quite dependent on the assumptions about the future market structure and fuel prices. Because we believe in the relative strengths of both approaches, statistical and fundamental, KYOS provides tools for both: a primarily statistical model with cointegration (KySim), especially for the medium term trading oriented applications, and a primarily fundamental model (KyPowerFundamentals, KyPF), especially for somewhat longer-term applications. Both models complement each other. The statistical model generates Monte Carlo simulations of fuel prices, which the fundamental model uses to generate power price simulations. and lower margins continue? And if so, what mechanisms will drive the power prices? How important will be the role of coal and gas to set these prices? 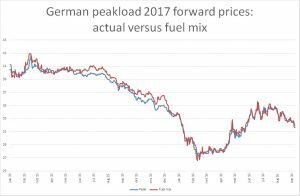 This situation as outlined for the German power market is applicable to all European countries. We believe both statistical and fundamental analysis help to provide answers. So far, even though absolute power prices have decreased, our statistical analysis shows that power prices are closely connected to fuel prices. Even more so than several years ago.